The existing national curriculum for the “Religious Studies” subject in Liberia is pluralistic. Children are given the impression that all beliefs lead to the one true God, an impression which clearly contradicts the words of Jesus that; “I am the way, the truth and the life, no one comes to the Father, except by me“. Teachers who teach the Christian component of this subject have often received little to no form of Bible training. Resources are few and opportunities for formal training, scarce. Therefore teachers in Liberia teaching Christianity in schools are in need of desperate guidance and assistance. In response to this great need, Core Training has embarked upon a seven-year initiative called God’s Great Plan for Children, aimed at empowering Bible teachers in schools across the nation to teach God’s redemptive plan in Jesus, which can be traced from the Old Testament to the New Testament. Phase 1 began in August 2017, with the first course taking place in Monrovia, Liberia to a group of 80-100 participants. 80 Bibles were provided to those who had none, as well as 120 pages of session notes, two books and audio copies of the talks. You can read more about this course here. In February 2018, two more courses took place in Ganta and in Voinjama. We plan to return to Monrovia in November 2018 to deliver the course again. Provide biblical foundations for teachers through a ten day course, ’Knowing the Plan of God’. Provide teachers with a suitable curriculum, and train teachers to implement the new curriculum in their classrooms. Follow up through observation and feedback, and determine which teachers are capable of training other teachers. Provide the trainers of teachers with a manual. Commence and monitor local teachers training other teachers. Observe, implement improvements and handover to local trainers. Your prayer and financial support would be greatly appreciated in this ministry. 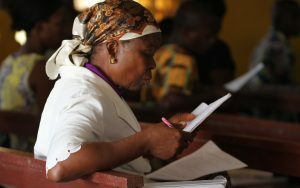 Support the teaching mission in Monrovia, Liberia to train 80 pastors and 150 scripture teachers.